Are you worried about a buddy? You might be facing similar challenges in life, but we all deal with stressors differently. Have you ever wanted to assist a fellow veteran dealing with a challenge, but weren't sure how to talk about it? What if it's something that you've never had to deal with before? 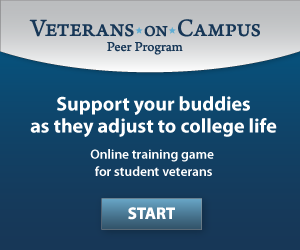 In this unique, game-based, online training, interact with virtual student veterans to learn tactics for identifying signs of distress in your peers, reaching out to fellow vets you are worried about, and referring friends to available support services. Choose your course and click "LAUNCH"
If you experience any technical difficulties, please email support@kognito.com. Support our student veterans. 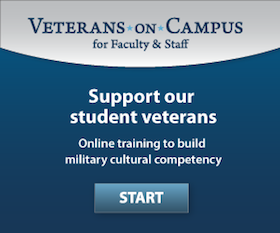 Start your online training to build military cultural competency. Page last updated November 20, 2018.